If you are contemplating a deep dive into your long term claims with the ‘permanent and totally disabled’ classification, the Claim Lab has some tools that will help you! These mature claims can be analyzed using a similar process to that used with LTD claims, with the claims being rated into categories. The model will rate the claims by profiling the claimant data and diagnosis data, based on previous experience, and highlight those claims that are less severe with return to work potential. Our experience is that lurking in the mature claims there are always some that are waiting for recovery. They may be genuinely ‘sick of being disabled’ and want to get back to work, or there is some element of malingering and, with some motivation, a return to work can be achieved. 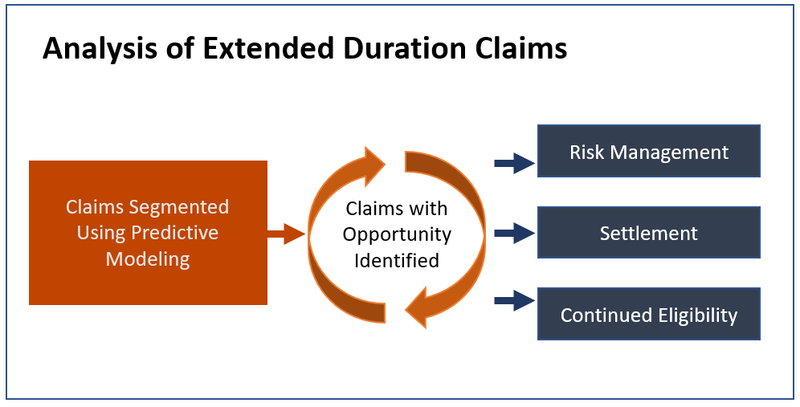 The Claim Lab analysis can highlight claims which have potential, so out of a population of 3,000 extended duration claims, a more manageable subset of around 100 could be identified for attention.